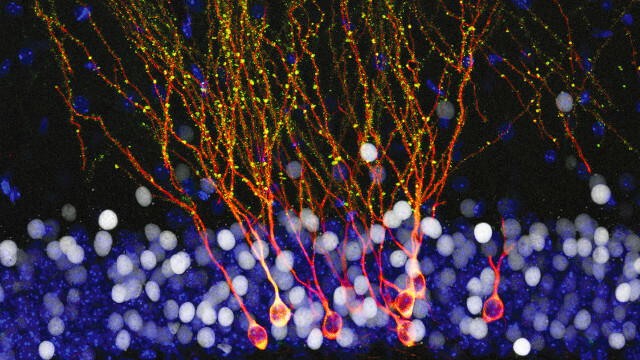 Granule neurons in the mouse dentate gyrusWIKIMEDIA, AVILA, J.Newly made cells in the brains of mice adopt a more complex morphology and connectivity when the animals encounter an unusual environment than if their experiences are run-of-the-mill. Researchers have now figured out just how that happens. 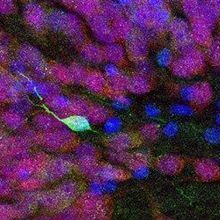 According to a study published today (October 27) in Science, a particular type of cell—called an interneuron—in the hippocampus processes the animals’ experiences and subsequently shapes the newly formed neurons. Most of the cells in the adult mammalian brain are mature and don’t divide, but in a few regions, including an area of the hippocampus called the dentate gyrus, neurogenesis occurs. 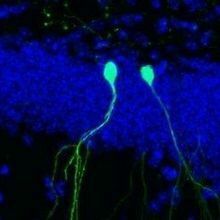 The dentate gyrus is thought to be involved in the formation of new memories. 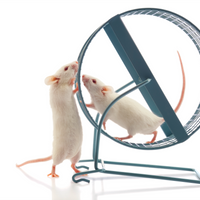 In mice, for instance, exploring novel surroundings electrically activates the dentate gyrus and can affect the production, maturation, and survival of the newly born cells. Now, Alejandro Schinder and his team at the Leloir Institute in Buenos Aires, Argentina, have investigated the process in detail. Newborn dentate gyrus neurons, which are called granule cells, take six weeks to fully develop and integrate into the mouse brain’s existing neural networks, said Schinder. 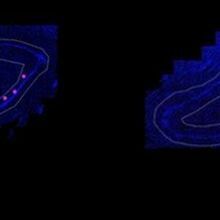 To examine these cells’ development, the team labeled newborn granule cells with red fluorescent protein in the brains of mice and then either left the animals in their regular cages (controls) or exposed them to enriched environments—cages with tunnels and other unusual objects—for different 48 hour periods. Three weeks after the new cells were labeled, the team examined their morphology and activity. The researchers found that in animals who had been exposed to the enriched environment during a particular period (9 to 11 days after labeling), the young granule cells had longer dendrites with evidence of increased connections with other neurons. Specifically, these cells had a greater number of dendritic spines, the sites of incoming synapses, and more detectable electrical inputs. Granule cells receive different inputs from surrounding neurons at different stages of their development, Schinder said, which may explain why they are apparently receptive to experiential input only within a short period (day 9 to 11), rather than throughout their development. The team went on to analyze these neuronal inputs more closely. Through a series of optogenetic and chemogenetic experiments, the researchers showed that mature granule cells activated their younger counterparts via intermediary cells called interneurons. Artificially stimulating either the mature granule cells or the interneurons could recapitulate the effects of environmental enrichment on the young granule cells. Moreover, the team showed that blocking the activity of the interneurons during the animals’ exposure to enriched environments prevented the expected experience-induced morphology in the young granule cells. As yet, those questions remain unanswered. D. D. Alvarez et al., “A disynaptic feedback network activated by experience promotes the integration of new granule cells,” Science, 354:459-65, 2016.